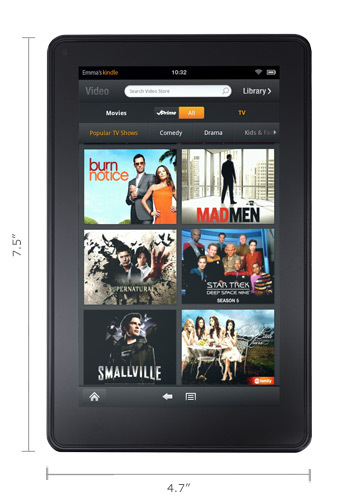 As expected, Amazon entered the tablet fray with a 7″ offering it’s calling the Kindle Fire. At just $199, it promises to be the first serious challenger to the iPad’s dominance in the tablet market. With a 7″ color LCD touchscreen instead of the iPad 2’s 9.7″ screen, the Kindle Fire is smaller, lighter, and cheaper than the iPad, but is designed even more for content consumption rather than the iPad’s limited content creation capabilities. It boasts Wi-Fi connectivity, and is designed for watching movies, playing music, surfing the Internet, using apps, playing games, and reading magazines, comics, and e-books. It lacks cameras, GPS, bluetooth, and some other advanced features of full-fledged tablet computers, but at less than half the price of Apple’s cheapest tablet (which runs a hefty $499), that’s a trade-off many people will be willing to make. Amazon also has the advantage of connecting their new Kindle Fire to their burgeoning content marketplace: Amazon Video on Demand, the Amazon MP3 Store, the Amazon Android App Store, and, of course, Amazon’s class-leading Kindle E-Book Store. In fact, a $79 subscription to Amazon Prime (which nets users free 2-day shipping on Amazon purchases) comes with a library of free streaming movies and TV shows, free apps and games, and even a free library of Kindle e-books. Similarly, Amazon offers to store any content you purchase from them (movies, music, apps, newspapers, magazines, e-books) in their Cloud storage for free — so you can always download your content and don’t have to worry about running out of space on the device itself. Amazon’s WhisperSync service also saves your place in e-books and movies, so you can pick up reading or watching where you left off if you switch to your Kindle or computer. Still, the most impressive spec is probably the sub-$200 price, which gets you a portable mini-tablet connected to the Amazon content ecosystem. For current Amazon customers (especially Amazon Prime subscribers), it’s an almost irresistible gadget for the price. And for anyone looking for a 7″ tablet, it’s a great bargain — handily undercutting the competition. My only gripe about the Kindle Fire is the same gripe I have with all LCD-based tablet computers being marketed as e-readers: most people find LCD screens tiring on the eyes, and would prefer the reading experience on an e-Ink screen (which is easier on the eyes, visible in bright sunlight, and allows for much longer battery life). But as a movie-streaming, game-playing, Internet-surfing device, the Kindle Fire looks like a hot gift this holiday season. When Amazon finally came-out with a color, backlit reader, I was certain that it would have the hybrid screen that I know has been in development for a couple years, now… a screen that is capable of being both backlit via either LED or LCD, just like any other tablet computer, as well front lit, like any e-ink screen. I was surprised, then, that Amazon released the Kindle Fire in its present form. I just don’t see how its really any different from any normal tablet, but just with the Kindle app installed on it. In fact, given that the Kindle Fire doesn’t, in fact, have the hybrid/combination LCD (or LED) backlit and front-lit e-ink screen, virtually any 7-or-8-inch-screen Android or Windows tablet/slate computer with either an LCD or LED screen, running the completely free both Kindle and Nook book apps would be a far, far, far better purchase; and would give even better utility with regard to both Amazon and Barnes and Noble e-book downloading and reading. In fact, Google Books and other such apps could all be added, too, resulting in a far, far better and more flexible overall product than the Kindle Fire product. Now, the little $79, e-ink regular Kindle that Amazon’s selling for Christmas this year… that’s a whole ‘nuther story! That’s actually a quite nice little Christmas gift for someone wanting to get into the whole e-inked Kindle world. …not when for not very much more (maybe even the same price), one can get a fully-fledged Windows or Android tablet/slate computer which will do a heck of a lot more than even the Kindle Fire in terms of regular everyday computing; and which can then use the downloadable Kindle, B&N, Google Books, etc., apps and have the best of alll worlds! Thanks for stopping by and sharing your thoughts. I was also a bit disappointed (but not too surprised) that Amazon didn’t use a color e-Ink or Mirasol reflective display, especially when I just saw news of a Mirasol-based e-reader by Kyobo (a South Korean company) that looks promising. I guess Amazon, B&N, etc. don’t think Mirasol or color e-Ink are quire ready for prime time yet, but I would certainly love to see a device by next year that combines the best of e-Ink (easy on the eyes, read in the sun, long battery life) and LCD (color and video) screens. As to your point about getting a generic tablet, I understand that you actually can run the Nook app on the Kindle Fire. I also understand that Amazon is not preventing users from rooting the Fire and using it as a generic Android tablet. And its specs seem to be pretty impressive for the price — I don’t think there are other generic Android tablets for $199 that beat it. That being said, it does seem to be better-suited to people who want to use Amazon’s large content ecosystem. As for the $79 Kindle, I agree that Amazon will probably sell a ton of those — and that they make a great, low-cost way to introduce someone to e-reading. Amazon’s press release today says they’ve sold 4x as many Kindles this Black Friday as they did last year (when sales were already impressive). The Kindle Fire has far superior hardware specs and a much nicer screen. I haven’t used the Archos, but just from the specs it doesn’t look like a great alternative to me. But to each his own. I didn’t mean to suggest that it’s an exact match. Don’t forget that it’s an Android device, not a desktop or laptop PC. The differences you point out are HUGE when running Windows; and so the word “superior” is more appropriate in that case. But those very same differences are comparatively — and that’s the operative word — insignificant, in terms of overall net performance, when running the Android OS. The most salient of the differences, as a book reader, is the screen resolution; and all that that particular difference means, in real terms, is larger letters on the screen on the Archos. Remember, also, that slate/tablet computers are rarely asked to do the kind of work that a desktop/laptop PC — even one running Linux, on which the Android OS is based — is typically asked to do. A little CPU and RAM goes a long way on an Android device. …and at least PART of that opinion is based on the point I made in the first post, to wit: That regardless which device one chooses, they’re both, because of back-lighting, the wrong way to read. In lesser-of-two-evils situations, choose protecting the pocketbook while simultaneously getting the best featureset. All the speed in the world won’t help a Kindle Fire be everything that a true and fully-featured Android tablet/slate can be. The “superior” specs of the Fire won’t make a whit of difference if the device can’t, because it’s a reader first and a computer second, perform the non-reader task. Take a larger step back and see the bigger picture, is all I’m saying. Oh, I definitely agree that if you mainly want something to read on, a Kindle 3 or Kindle 4 is the way to go (and cheaper, too). And better on the eyes, too, because of the e-ink reflective technology! More than just early Kindles and Nooks have it. There’s Sony, iRiver, and a long list of well-known others. Ultimately, that’s what makes any e-book reader something special. I’m sad to see the new color ones without at least the hybrid LED/e-ink display. It’s just going down the wrong road, in my opinion.